This section gives an overview of how protocols that describe various processes, such as sampling, extraction and scanning, are used in BASE. A protocol is something that defines a procedure or recipe for some kind of action, such as sampling, extraction and scanning. The subtype of the protocol is used to determine what the protocol is used for. In BASE we only store a short name and description. It is possible to attach a file that provides a longer description of the procedure. The procedure described by the protocol may have parameters that are set indepentently each time the protocol is used. It could for example be a temperature, a time or something else. The definition of parameters is done by creating annotation types and attaching them to the protocol. 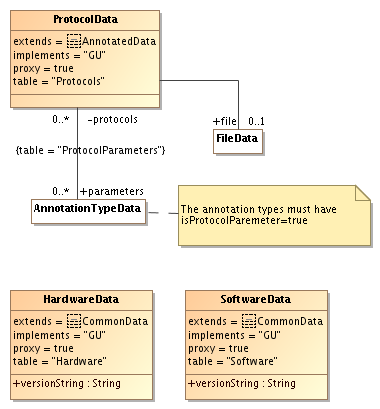 It is only possible to attach annotation types which has the protocolParameter property set to true. The same annotation type can be used for more than one protocol, but only do this if the parameters actually has the same meaning. BASE is pre-installed with a set of subtypes for hardware and software. They are typically used to filter the registered hardware and software depending on what a user is doing. For example, when adding raw data to BASE a user can select a scanner. The GUI will display the hardware that has been registered as scanner subtype. Other subtypes are hybridization station and print robot. An administrator may register more subtypes.